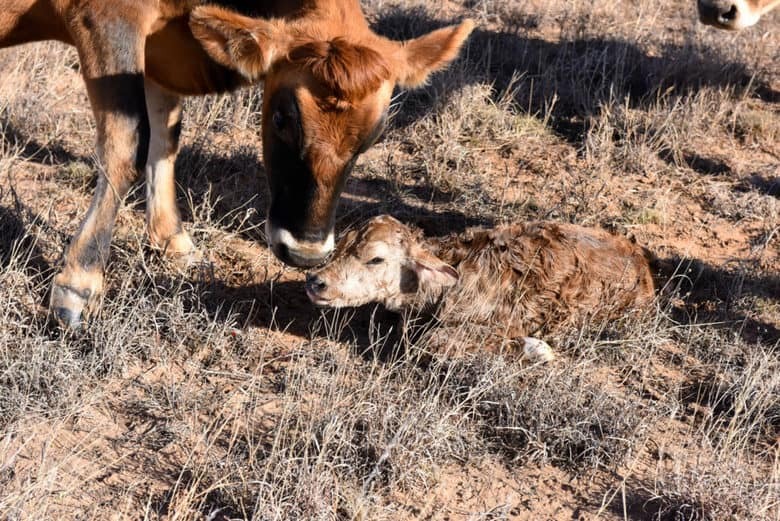 Fresh Milk is Coming – Meet Our New Calf! I would like to introduce you to “Decks” our new calf! No, we did not first see him from our deck! His name is in keeping with the holiday song, “Deck the Halls”. We knew that his mother, Beatrice, was soon to delivery and have been watching her closely for a week or so. Concerned and with ulterior motives – we are ready for fresh milk! 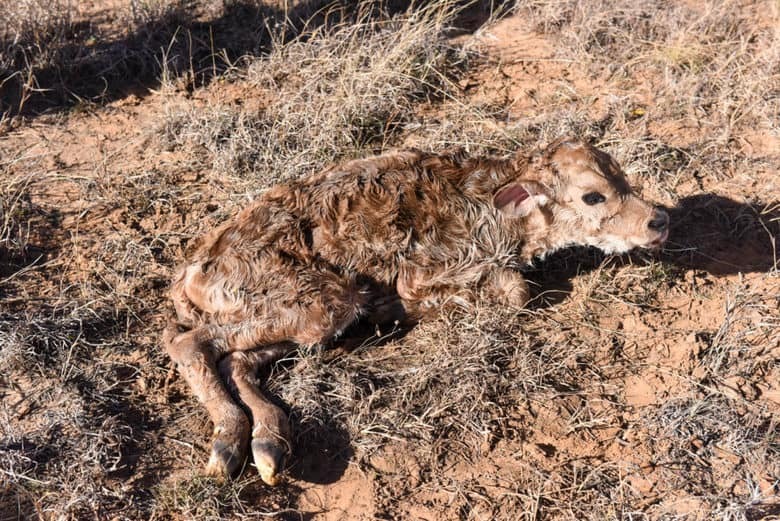 If you are wondering how to tell if a cow is ready to calve, check out Signs of Calving and How to Tell if Your Cow is Ready to Calve. Every morning, I get up and get coffee before anyone else and I always look over the pasture and check to see where she is. On Saturday morning, she was difficult to find, not grazing along with the others and was laying down. That was my first red flag. Once coffee was made, I checked again and she was standing still. As John and I had coffee in bed, our 16 yr old son went out to check her. When I saw him running back, I knew something was up! This was my second red flag. Sure enough, she was in labor and you could just see Decks’ nose beginning to show with his hooves! Finally, he was here! He is a full Jersey bull and weighed in at 95 lbs. 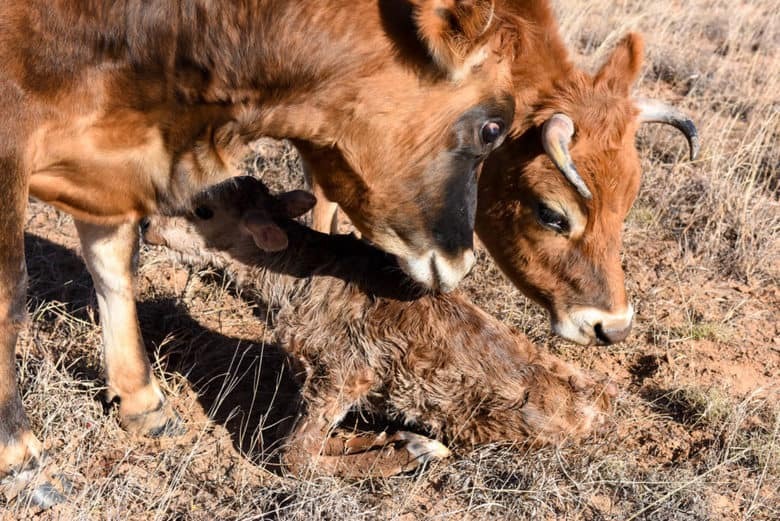 It is always so adorable to see a mamma cow stand over and clean a new calf. And, to watch them respond to the mother’s stimulation by trying to get up almost immediately! You can see Beatrice’s udder below – it is huge! Yes, fresh milk is almost here. You might think that we could begin milking her right away but that is not the case. We keep the calf with her for 24 – 48 hours making sure it is nursing. Then, we start by milking her a bit at a time. Jersey cows are susceptible to milk fever which is a calcium depletion. By increasing the milking time slowly, we help alleviate the danger. We also give a couple of tubes of a calcium supplement to the cow either right before delivery or right afterward. The second tube is given about 12 hours after calving. 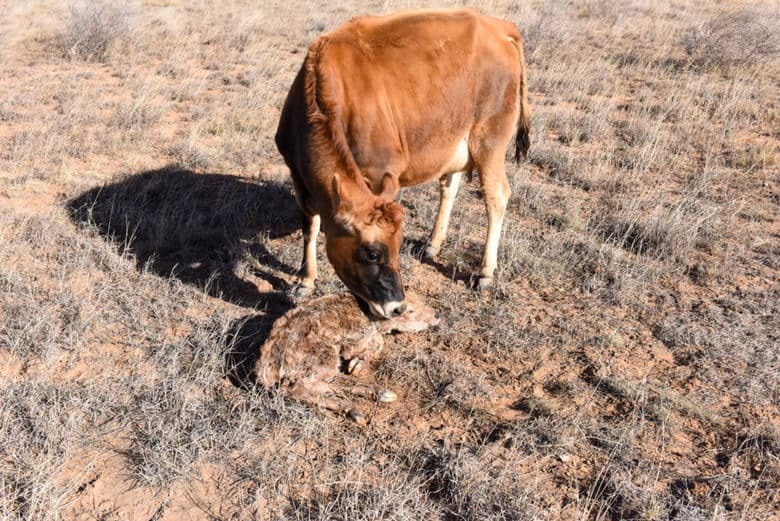 You can read Being Prepared After a Cow Calves for more details. 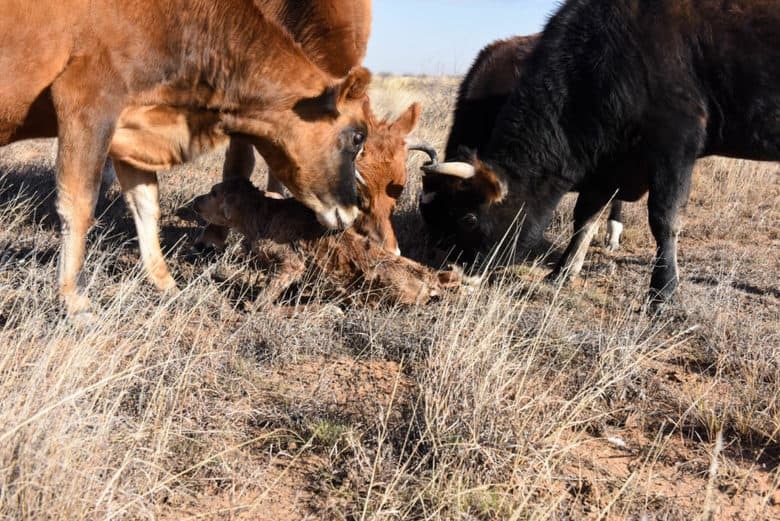 We have a large steer (to the left in the photo below behind Beatrice), a bull (front right) and a heifer (behind the bull on the right) that all had to welcome the new calf. It was cute but I admit, I was a bit concerned that they might step on Decks! Thankfully, they didn’t! It was really quite funny to see them all licking the new calf – a real barnyard family or should I say, herd! Below you can see one of Decks’ s attempts to stand but everyone is licking him and they push him back down! Backy (named because he was born backwards), the steer with horns was probably the most helpful to Beatrice. He stayed around and gave the occasional lick. It was as though he was saying, “Come on, boy, you can do this!”. 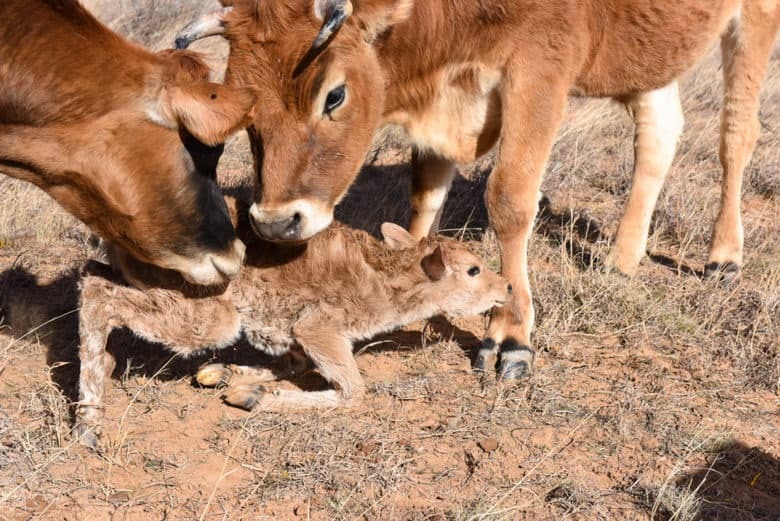 It is amazing how developed a new calf is when it is born. Their wobbly attempts to stand are met by many face plants into the dirt. But, they don’t give up. Keep on keeping on! Finally, Decks did stand. The morning had been warm and nice but, it is west Texas. While we were getting them back to the shed in preparation for a cold front, the wind stopped completely. It had been blowing from the southwest. After a few minutes, the wind began to blow from the north. Within 30 minutes, the temperature had dropped 30 degrees! Decks and Beatrice survived the 6° F weather that night in the shed and both are doing very well. Milking is going well although she is still giving colostrum. Fresh milk should be here any day! Thanks, Zesty Olive – I appreciate your encouragment! It turned cold today and we had hot chocolate – Mmmmmm good! Congratulations on a successful birth! I had no idea Jerseys were so big, I had them in the “small cattle” section of my brain, I guess. I have a question for you – do you keep the bull with everyone else, all the time? We have 5 Dexter cattle (1/2 sized animals, they come up to my waist), and we have decided, for now, to keep one of the bull calves. At this point, all I have are females I’d like to get pregnant, but if the calves next year are female, I think I’ll have to put the bull in a separate pen for a few months while they mature. Have you had to do this? Becky, we haven’t needed to separate them yet but I would if we had an immature female that I didn’t want to get pregnant. For now, we just have a couple of steers and a less than a year old heifer (Maybelle). We probably will need to separate them so Maybelle can mature in a few months. I actually looked for a Dexter bull – they are so cute and have a good reputation for calm disposition but couldn’t find one here in west Texas! This is beautiful ! I grew up on a small Jersey farm, but the expectant moms were sent away just before they calved. This maximized the price Dad got for them, and we needed the money. How beautiful to see the other herd members welcoming the new arrival with a lick. This shows the loving heart of God in His creatures. I’m wondering how long you let the calf stay with ‘mom’ before separating them. Is it just the 24-48 hours you mentioned ? 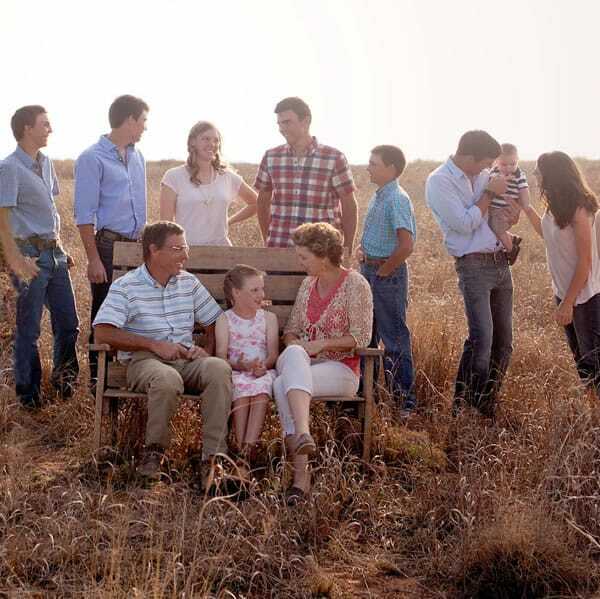 Sue, thanks for sharing your memories – how neat! Yes, we leave them together for 24 – 48 hrs then separate them, begin milking and feed the calf with a bottle. This maximized the milk we get and helps the calf bond with us. It is amazing how a mama cow can hold back the milk when she is wanting to give it to her calf! We do have an amazing Creator!